Right now, Autozone has Pennzoil Platinum 5 quart jugs for $27.99. See link below and click "Get this deal". Purchase of the 5 quart jug makes it eligible for a $15 Autozone rebate/gift card. See link below. claim a $15 AutoZone Gift Card." FILE ONLINE USING OFFER CODE "AUTO1603"
Autozone is also listed as a participating retailer for the Pennzoil $10 5 quart jug rebate. I have done this offer in the past and received both rebates. Mobil by the quart. $2. If you prefer to use specific filters and don't want the STP or the K&N upgrade, here is a straight deal on the oil only under the same system that no one seems to understand. First you go to Autozone and search for Pennzoil Platinum. In the results you will see regular or high mileage. Underneath those you will see a link that says "Save now see details". Click that link and 3 appear. 1 is oil only for 26.99 before rebate and giftcard. 3 adds in a free air filter for the same 32.99. Obviously the best deal is the oil only link. Select that and it adds it to your cart for 26.99. Proceed from there with the Giftcard and rebate promotions. Link is just and example with 5w-30 High mileage for my old Camry. 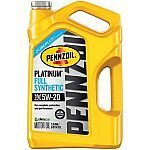 Autozone weekly ad has 5 QT Pennzoil Platinum or High Mileage oil and STP oil filter for $32.99 - $15 Autozone mail in giftcard - $10 mir(manufacture) = $7.99 + tax. I think it's only BM and by location. This is from Sacramento, CA. This is my first post ever. Please be gentle. AutoZone. This is the last day for this if it doesn't get extended in the next circular, but better late than never! Online or In-Store! Expires 10/15! Use the Mobil 1 Fall rebate below for a $17 check that takes about 6 weeks. I already got mine for an AutoZone purchase made from the last circular. Hop on this if you need a good synthetic oil and a filter! AutoZone has the 2 pack of gallon Rotella T6 5w-40 on clearance. It's marked $39.99 but rings up at $19.97. There's a $14 rebate, making this $5.97 total after rebate. Limit 4 cases per rebate rules. Receipt scan attached. I don't know of any way to check stock at the stores other than just visit them. I cleared out the 4 at my local store in Lake Orion, Michigan. btw I run this oil in all my cars now, even non-diesel. Great stuff for many reasons.